Brexit: Could Corbyn's Labour boost state aid when UK leaves EU? Brexit could be an opportunity to pump more cash into British industry, according to Jeremy Corbyn. 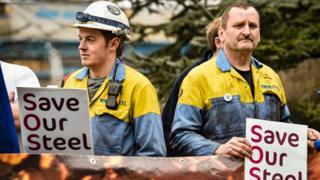 The Labour leader said European Union rules restricted so-called "state aid", so Brexit could make it easier for the British government to support the British steel industry for instance. But other EU member states, such as France and Germany, spend far more than the UK on state aid despite also signing up to the same single market rules, so are they really an obstacle? And leaving the EU may not mean an end to rules. Other state-aid restrictions would be likely to apply to post-Brexit Britain, such as World Trade Organization rules and the terms of any future trade deal with the EU. State aid is financial assistance given by the government to companies or other organisations that has the potential to distort market competition. The aid can be in the form of direct cash grants or indirect aid - such as preferential borrowing rates or tax credits. Under EU rules, member-state governments are allowed to provide state aid only with approval from the European Commission. For example, in 2015 the UK government submitted plans to provide a subsidy to Drax power station to convert one of its units from coal to biomass. Following an investigation, the commission ruled in favour of the scheme last December. There are exceptions to the rules. For example, governments can provide aid for broadband infrastructure without prior approval. And aid worth less than 200,000 euros over three years is exempt. Do the rules prevent support for the steel industry? The EU Commission says too much steel is produced in Europe. As a result, it has been inclined to take a fairly tough line on state aid in this sector. In 2016 for example, the commission ordered Belgium to recover 211m euros in illegal state aid to its steel industry. That does not mean all state aid is impossible, but the government would have to make a case that assistance was within the rules, or fell under one of the exemptions. One possibility would be to argue that the steel industry was essential for national security, but it is far from clear the commission would accept that. Will state aid be easier after Brexit? Both Labour and Conservative policy is to take Britain out of the EU's single market after a transition period. This would mean the UK was no longer formally bound by the EU's state aid rules. However, the EU is concerned the UK could use Brexit as an opportunity to undermine the single market, by giving its companies an unfair advantage. "Any agreement must respect the regulatory autonomy of the EU, as well as the integrity of its legal order," says the EU's chief negotiator, Michel Barnier. UK Prime Minister Theresa May addressed this concern in her Florence speech, saying both parties agree "trying to beat other countries' industries by unfairly subsidising one's own is a serious mistake". This seems to suggest a final UK-EU deal may contain an agreement on state aid. After Brexit, Britain will still belong to the World Trade Organization, which also has state aid rules - members can impose tariffs on countries that excessively subsidise domestic industry. Could the UK be doing more now? The EU measures how much money countries spend on state aid, as a proportion of their economy. The UK ranks very low down, spending just 0.35% of its gross domestic product. This is far lower than Germany (1.22%) and France (0.62%). Therefore, it seems likely that EU single market rules are not the only thing limiting state aid. "Successive governments have not wanted to invest, and they've used EU law as a good excuse for not doing so," says Stephen Kinsella, a competition lawyer and Labour member. Jeremy Corbyn also raised the question of whether EU rules were an obstacle to taking sections of the economy into state ownership, which Labour pledged to do in its manifesto for this year's general election. One such area is the railways, which were privatised in the 1990s. The EU has adopted new rules that seek to create a single European railway area. The aim is to allow rail companies to operate across Europe and to open up the market. The new rules are not in force yet and it is hard to predict how they will be interpreted - but they do seem to rule out the national monopolies of the past, such as British Rail. Instead, it is envisaged that in the future, rail-service contracts would normally be awarded through a competitive tendering process, as they currently are in Britain. But that does not rule out state-owned railway companies running services. And it remains to be seen how widely the new rules will be applied.